Countywide Recycling Drop-off Locations are available. 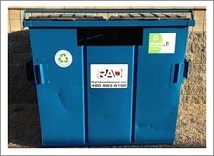 Recycling containers can be identified by both the RAD and Pinal County Recycling decals. Please check the list of locations for the latest information on what can be put into these containers.